John Langdon (June 26, 1741 – September 18, 1819) was a politician from Portsmouth, New Hampshire, and a Founding Father of the United States. He served as a delegate to the Constitutional Convention, signed the United States Constitution, and was one of the first two United States senators from that state. As a member of the Continental Congress Langdon was an early supporter of the Revolutionary War. He later served in United States Congress for 12 years, including as the first president pro tempore of the Senate, before becoming governor of New Hampshire. He turned down a nomination for Vice Presidential candidate in 1812. Langdon's father was a prosperous farmer and local ship builder whose family had emigrated to America before 1660 from Sheviock, Caradon, Cornwall. The Langdons were among the first to settle near the mouth of the Piscataqua River, a settlement which became Portsmouth, one of New England's major seaports. Langdon attended the local grammar school run by a veteran of the 1745 Siege of Louisbourg against the French at Fortress Louisbourg in New France. After finishing his primary education, he served an apprenticeship as a clerk. He and his older brother, Woodbury Langdon, rejected the opportunity to join pop in their father's successful agricultural livelihood and apprenticed themselves to local naval merchants instead. By age 22, Langdon was captain of a cargo ship called the Andromache, sailing to the West Indies. Four years later he owned his first merchantman, and would continue over time to acquire a small fleet of vessels engaging in the triangle trade between Portsmouth, the Caribbean, and London. His older brother was even more successful in international trade, and by 1777 both young men were among Portsmouth's wealthiest citizens. Langdon served as a member of the Second Continental Congress from 1775 to 1776. He resigned in June 1776 to become agent for the Continental forces against the British and superintended the construction of several warships including the Raleigh, the America, and the Ranger, which was captained by John Paul Jones. In 1777, he equipped an expedition against the British, participating in the Battle of Bennington and commanding Langdon's Company of Light Horse Volunteers at Saratoga and in Rhode Island. In 1784 he built at Portsmouth the mansion now known as the Governor John Langdon House. Langdon was elected to two terms as President of New Hampshire, once between 1785 and 1786 and again between 1788 and 1789. 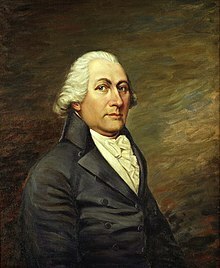 He was a member of the Congress of the Confederation in 1787 and became a delegate to the Constitutional Convention in 1787, serving as a member of the New Hampshire delegation. Langdon was elected to the U.S. Senate and served from March 4, 1789 to March 3, 1801. He was elected the first President pro tempore of the Senate on April 6, 1789, and also served as president pro tempore during the second Congress. In 1798, Langdon assisted Oney Judge to evade Burwell Bassett, the nephew of George and Martha Washington, who had intended to kidnap Judge and return her to slavery with the Washingtons. Langdon later served as a member of the New Hampshire Legislature (1801–05), with the last two terms as speaker; he served as governor from 1805 to 1812, except for a year between 1809 and 1810. In 1808, his niece, Catherine Whipple Langdon, married Edmund Roberts. Langdon declined the nomination to be a candidate for Vice President with James Madison in 1812, and later retired. He died in Portsmouth in 1819 and was interred at the Langdon Tomb in the North Cemetery. The town of Langdon, New Hampshire is named after him, as well as Langdon Street in Madison, Wisconsin, a town with numerous streets named after founding fathers. ^ "Avalon Project – Madison Debates – July 10". Retrieved July 30, 2016. ^ "Calvin Howard Bell Family". extract from Bell Family History. Access Genealogy. April 23, 2012. Archived from the original on November 4, 2011. Retrieved April 19, 2012. Judge Woodbury Langdon, of Portsmouth, N. H.; Delegate to the Continental Congress, 1779; President of N. H. Senate, 1784; Judge of the Superior Court of N. H., 1782–91....(a) Catherine Whipple Langdon: m. 1808, Edmund Roberts, of Portsmouth, N. H.
^ "Wisconsin Historical Society". Retrieved July 30, 2016. United States Congress. "John Langdon (id: L000067)". Biographical Directory of the United States Congress. "The Founding Fathers: New Hampshire." U.S. National Archives and Records Administration. Wright, Jr., Robert K; MacGregor, Jr., Morris J. (1987). "John Langdon". Soldier-Statesmen of the Constitution. Washington, D.C.: United States Army Center of Military History. CMH Pub 71-25. Chisholm, Hugh, ed. (1911). "Langdon, John" . Encyclopædia Britannica (11th ed.). Cambridge University Press.